Apple User Groups from the Carolinas to Ohio, New Jersey to New York are planning picks and other social events this week, but some groups are hosting more serious topics. Bob “Dr. Mac” LeVitus will talk productivity with an Oregon group, while Jeff Gamet of The Mac Observer will be discussing iOS 11 and High Sierra at a Colorado group. A Michigan group will look at the benefits of VPNs, and a Texas group will host a cybersecurity session presented by an agent of the FBI. 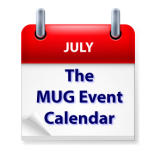 Sunday 16-Jul MacGroup-Detroit – Your internet Privacy: “VPNs – What are they?